I just lovethis page I just scrapped of Charlotte. See the cupcakes I stuck in there? The kit is cherry-themed, but love those little cupcakes! Anyway, I had so much fun following along (as I assume others did too!) the baking get-together of The Pioneer Woman and Bakerella. Gwen's 3rd birthday is coming up, and I've been trying to think about what goodies to make. We are not doing a big party for her, just a family get-together. So I am wondering if I can get my act together to try some of those cake pops that they made, it looks so fun! And also do some plain old cupcakes, just to feed the hungry hordes, so to speak. -Gwendolyn potty learning... BUT if she's tired, then she totally forgets about it. Boo hoo for me, more laundry. But she is having lots of successes! -Visiting Pullen Park on the first day of spring... it was chilly a bit, but we had fun planting some seeds, having a picnic, playing and letting the girls ride the boats and carosel. Then heading over to feed the ducks at the lake... Funny moment- I was going to take Gwen to potty after feeding the ducks, but unfortunately, as she was crouching on a picnic table bench, she had a little accident... one of the moms noticed as it ran down the bench... oops! Theme: Gwen fell asleep within minutes of leaving the park... so tired Gwen, crouching Gwen means accident-prone Gwen. -Watching our pea plants grow. Need to post some pictures! -Learning about birds with Charlotte, then watching her draw a bird and label it. -Gwendolyn counting how old she is... putting 2 fingers up, then carefully adding the 3rd finger. -Listening to J and Charlotte's voices murmuring... J usually tries to spend some time with Charlotte, playing a game or something like that, on Saturday. -Finding a picture of J and Gwendolyn on our church's updated website. Guess we have to join now! Okay, enough rambling. But isn't that what Saturdays are all about? Just sort of "rambling" through your day? Oh, well, theoretically, I am supposed to be productive... never quite get everything done, but that's OK I still love Saturdays. Wow, going crazy with the blogging here! Anyway, managed to contract a lovely cold from Miss Gwennie (as we've been calling her lately) so I'm sort of dragging on the home front. I'm actually supposed to be on a "scrapping hiatus" but I had signed up to post on the team blog for one of my designers, Kristin Cronin-Barrow, so that gave me an excuse to scrap. I created a couple of "quickpages" that are ready for you to pop your photos in this afternoon. So, here's the link, the download links are on the blog there! 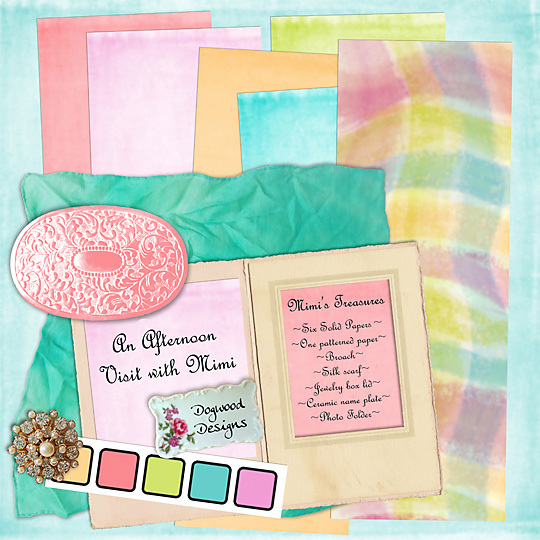 I get some weird idea that I could actually "design" digital scrapbook kits. The last time I made one, it completely burned me out. It's very challenging! This time I attempted to keep it a bit more simple, but nonetheless it has been a challenge and took many hours the past couple of days. I know that if I *were* to attempt to do more of this, even just to give away freebies as part of the learning curve, I simply would have to do it at night on a computer of my own... this computer just cannot handle it because the harddrive is too full. And it causes me to too often say, "Just one more minute!" to my girls. So that's not acceptable. And here's the "preview"! Mimi is what I called my grandmother when I was little, it is inspired by her, the colors remind me of her home and some of the "elements" I got from her, like the jewelry box and little ceramic name plates. 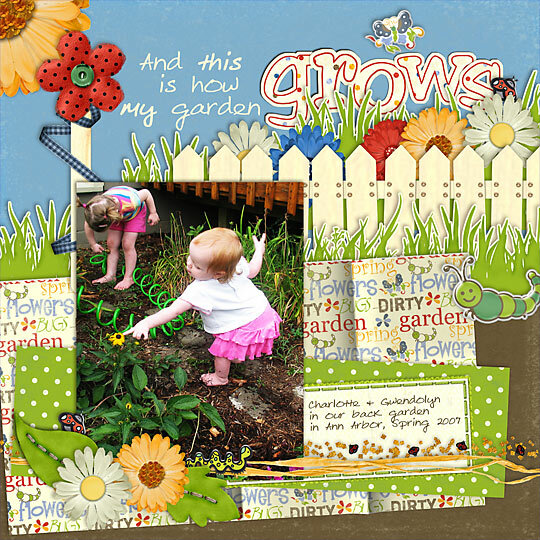 Well, today is National Scrapbooking Day! If I had any money at all to spend, I would be quite happy about that right now, lol! There are many, many sales going on right now. But it is exciting to see all the beautiful layouts for the Scrapper's Choice Awards at DigishopTalk... last year I was a judge, but I don't think I'm elegible to judge this year as a board moderator. But wow, so many gorgeous pages I missed along the way! It's also a bit nostalgic for me, because it's now been over a year since I've been digi-scrapping the "second time around." I sometimes have mixed feelings about this hobby- I enjoy it soooooo much, but it does take a lot of time (during the girls' quiet time or in the evening occassionally) and also some money, though much less than traditional scrapbooking I think. It has been quite a few months since I spent any money at all. I'd like a small budget for this hobby again one day, though. But for now, I'm fortunate to be able to get some new products from my creative teams- I just try to keep myself focused on them, and not all the other wonderful new products coming out! It does help that I'm no longer tempted by many things since I know my style and what works or doesn't work for me.